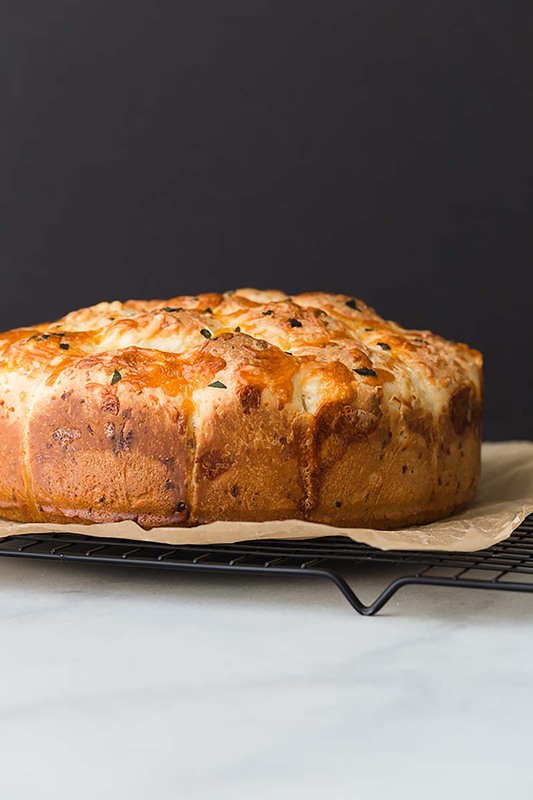 These dinner rolls are loaded with garlic, sharp cheddar, and Parmesan cheese. The ultimate cheesy roll to serve alongside soup and salad. In a small saucepan, heat the milk and sugar over low heat until it reaches 110-115ºF. Remove from heat, stir in the yeast, and set aside for 5 mins. Whisk in the egg and set aside. Add the flour, salt, and garlic powder to the bowl of a stand mixer. Fit the mixer with the dough hook attachment. With the mixer on low speed, gradually pour the yeast mixture into the flour. Continue to beat on low until the flour is incorporated, stop and scrape down the sides and bottom as needed. Continue beating until a dough soft dough forms, about 4 minutes. Add 1 cup (100 grams) of the cheddar cheese and 1 cup (100 grams) of the Parmesan cheese. Beat on low speed until just combined. Gradually beat in the softened butter a couple tablespoons at a time. Preheat the oven to 350ºF. Line a baking sheet with parchment paper and set a 9-inch springform pan on the baking sheet. Divide the dough in half. Divide each half into 8 equal sized pieces. (You should end up with 16 pieces total.) Roll each piece into a ball. Arrange the dough balls in the springform pan, seam side down. Combine the remaining melted butter with garlic and brush over the top of the dough. Loosely cover the pan with a clean towel and let rise for 30 minutes. Top the rolls with the remaining cheddar and Parmesan cheeses. Sprinkle with fresh basil. Bake until golden brown, about 30-40 minutes. Serve warm. The dough can also be made the night before. After dough has risen for 1 hour, gently fold the dough over onto itself inside the mixing bowl and cover the bowl tightly with plastic wrap. Refrigerate overnight or up to 2 days, then remove from the refrigerator and continue with shaping. Rolls will keep stored in an airtight container in the refrigerator for up to 1 week. Or in the freezer for up to 3 months. Thaw in the refrigerator overnight. Warm up in a 300°F oven for 10 minutes. I don't recommend using anything other than whole milk. It's needed for the best texture and taste. Instant yeast can be used instead of active dry yeast. The rise time may be a bit less. You can substitute the cheeses. Try white cheddar, Gouda, or Gruyere.